I noticed a lot more of us are doing things around the house, or getting a house. It would be nice to get some tips and tricks and have some questions answered. I was going to do that to my garage floor, but I dirtied the **** out if it when I was doing my clutch. I have to give it a real good scrubbing one of these days. Good thread showing what can go wrong and things to look out for. I'm not sure i would try it with a well used garage floor that's been oil spilled, etc. Acid etching and a good high pressure washing are a minimum. Some guys go so far as to grind down 1/4" of the concrete...and it still gets fucked up. Yea I was thinking about the tile instead for that exact reason. The tiles are more expensive. I'd need about $800 in tile to do my garage, but i'm sure i would spend more than $800 of my time doing the epoxy and it'd be a crapshoot on whether i'd be happy with the end result. Yeah I was going to make sure the floor was good to go. Sand it and wash it down. Fix any cracks. Question about inside the house. Has anyone done carpet? 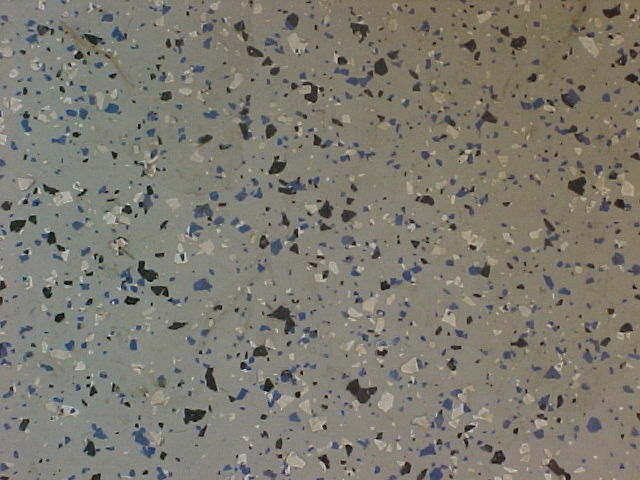 Or floor tiles? Just for the carpet I want is around 1400 for 2 rooms the hallway and living room. I want to do tile right there and take out that god ugly carpet. Sneak peek of my kitchen renovation. Durock laid, electrical done, drywall done. Cabinets and tile this week. Thanks man! It really made a world of difference, and PS no, I'm not taking a dump hahaha! Starting to get some dry rot on my 97 home on the front door and a window which should be an easy fix. \ I'm not taking a dump hahaha! 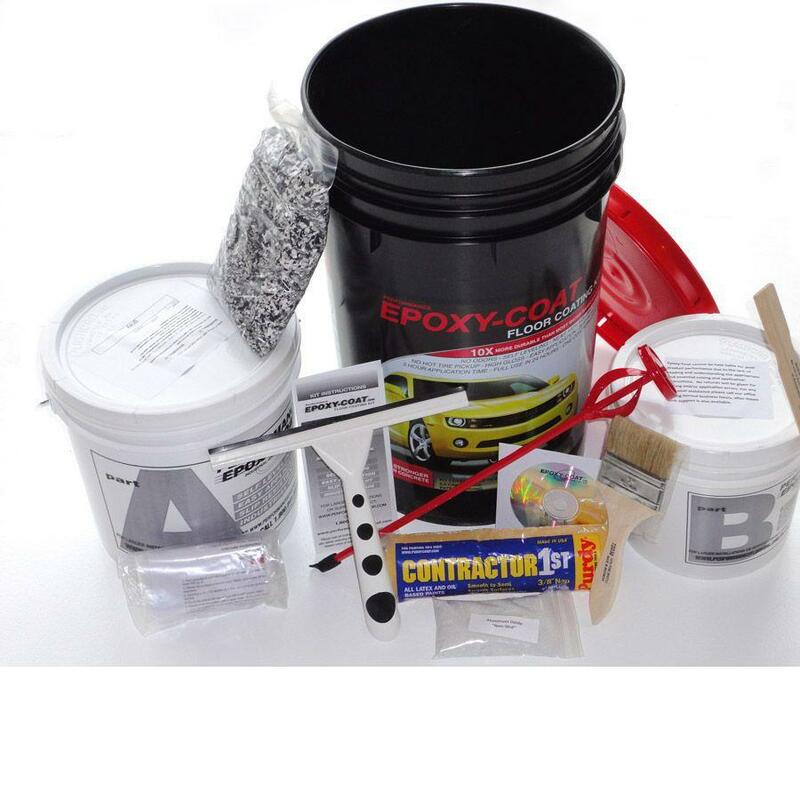 I have done two epoxy kits in my life. They were relatively easy and I just used a pretty cheap kit from Lowes/Home Depot. They came out okay, but it's not something I would want in my own home. I would prefer something "thicker" with texture. I see a lot of model homes around me with some really nice ones. I don't feel like paying the builder $1500-2000 to do this if I can do it myself. This is what I would like to get. It has quite a bit of texture. How do I achieve this? 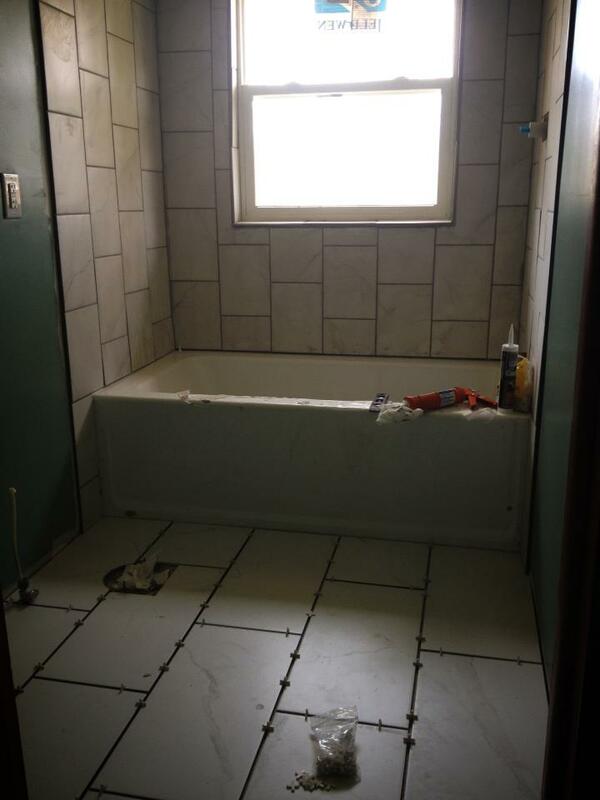 My builder would have charged me $1500 for a single line of accent tile in my shower. No thanks. I opted for the "free" white tile. But how easy is it to "knock out" a line of tile and put in my own accent strip? I'm not the biggest fan of DIY garage epoxy coatings. I helped put one down at a friends house (Online kit), and it came out okay. He had problems with bubbles due to high humidity or something. Ending up doing like 3 coats in total. I currently have vinyl tiles in my garage, thinking about racedeck after those wear out. 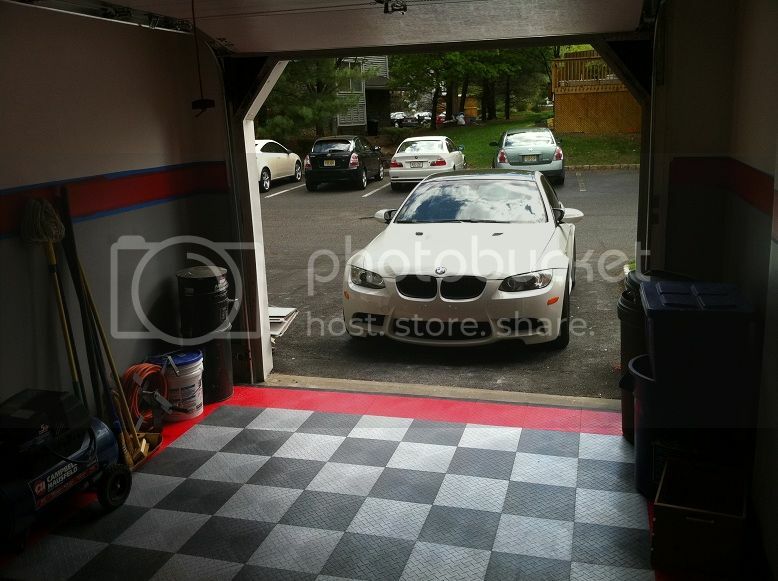 I had Racedeck tiling in my old 1-car garage in NJ. Very good quality, but a bit pricey. ~$800 for a 10'x19' space. I think there are cheaper alternatives that are just as good. There is a bit of noise when you walk on the tiles, so I got some cheap gardening fabric and placed it underneath the tiles. Lets air flow as well. 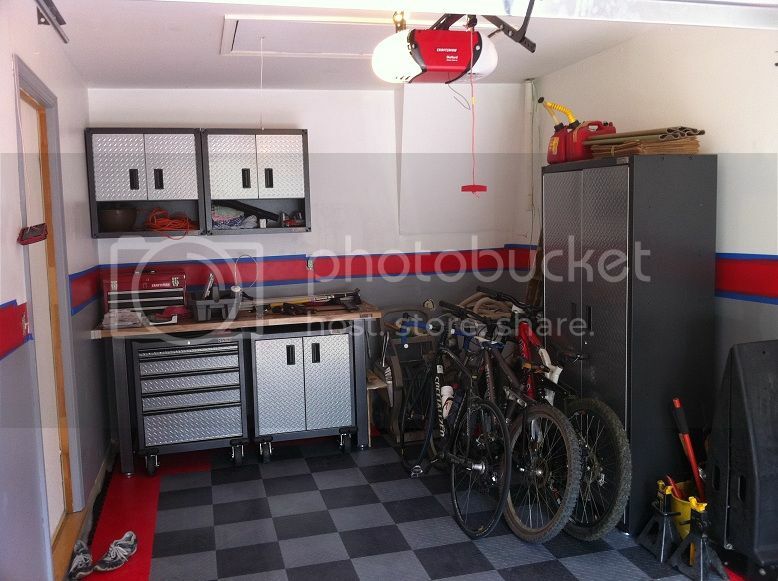 Maybe it was the silly color choice I made, but I think it cheapened the look of the garage. I think I want a "cleaner" look, hence I'm looking at the epoxy now. We'll see what I ultimately do. EDIT: That blue stripe on the walls is just painters tape. I was still working on this when I snapped the pic. That doesn't look bad. I think the one mistake you made was the color choice. It's just to busy for a small(er) one-car garage. Now if you were to do that color combo in a 2-3 car garage, it would look pretty good. That does seem a little expensive. My garage is more then double that. (2 car) Damn, I thought it was cheaper!